Young endurance rider Alexandra Toft is one of two equestrians to win the Rising Star Award at the 2011 Womensport Awards held in Brisbane on Saturday the 15th October. "Alexandra is the epitome of professional sportswomen, and we are proud of her extraordinary achievements and commitment to her chosen sport," states Barbara Timms, manager of the Australian Endurance Squad. The Tofts are successful endurance riders, with Penny competing at the 2010 World Equestrian Games on her horse Don and staying at the KER farm during the lead-up to the competition (read more). All the Toft's horses are fed Barastoc and KER products. TWO Dornoch horse riders successfully completed an International Endurance Ride in Wales recently, two of five Highlanders representing a 12-strong Scotland team at the event. Bragha Hayes, a 13 year old, second year pupil at Dornoch Academy, with her horse Sam, completed the two day 80km event, The Dragon's Egg, as a Scottish Junior, and Lois Canham (31) from Rearquhar with her horse Coral's Dream finished the 50km Novice Horse Event. Tough riding conditions across the steep Welsh hills, and soaring heatwave temperatures, resulted in only five of the 12 Scottish riders completing their events, resulting in a disappointing fourth place in The Home International and Celtic Challenge competitions. The home team, Wales, won the Home International, while Ireland won the Celtic challenge, with Wales winning the best team award overall. Having won both events in 2010, this was a disappointing result for Scotland. Following the completion of the track and the physical evidence and veterinary scheduled to be made this call for pairs to form part of our team who will represent the Spanish in the next Raid World Championship for Young Riders (to be played in Abu Dhabi the next day December 10). As can be seen, the Spanish team will consist of four pairs, which is however also a summons rather than be a reserve initially (until November 25). Lucero Miki wuth Gil Berenguer. Tra- Clica with Mariona Naranja. Junior World Championship will bring together the best teams, including the UAE, who are used to compete in the harsh desert conditions. Our team comes to this event with the baggage of its past successes, defending his condition, for example, Bronze medal in European Championship Kreuth 2010. 4 horses/riders and one reserve will be chosen. The Australian Team for the Young Riders World Championships to be held in Abu Dhabi December 10 was announced by the Chair of the Selection Committee Dr Anne Barnes at the pre ride briefing at the Quilty. The riders were presented with handsome saddle pads sponsored by the Squad Management. The AERA Board of Management offers its congratulations to all these young riders and acknowledges the time and effort of themselves and their parents and not forgetting the horse owners in submitting themselves to the rigorous demands of the Selection Committee. Brechin based endurance rider John Thomson and his pure bred Arabian gelding Prince Omar comfortably won their last competitive ride of the season in the 80-kilometre Highland Fling endurance ride. The Endurance Great Britain Silver Medallist combination completed the demanding course in just over six hours and firmly moved themselves past the EGB Advanced Class to gold medallists. John and Omar now qualify as Federation Equestre Internationale (FEI) One Star horse and rider for the 2012 season. The 80-kilometre Highland Fling is a demanding and at times very tough course that takes the riders through some spectacular Easter Ross countryside. The first vet hold was at a short 24K into the course where John and Omar, ably supported by their crew former Inverbervie policeman Douglas Munro, cleared the vetting in 12 minutes. The riders were then faced with a long pull of 36K along the side of Loch Morie and the Kildermorie estate back to the second vet hold at 60K. Omar was again quickly vetted but a veterinary general recall for all horses resulted in one elimination on the re-check and a subsequent departure delay. This meant that Team Omar went over hold time but a crew protest ensured that the time allowance was regained. Although leaving last out of the vet hold John caught the lead rider five kilometres out and then went in front for the final 17 kilometres. It has been a remarkable year for Team Omar, starting 300 miles south of home in the Cumbrian hills in April for the first EGB National Ride and concluding 200 miles north of home in Easter Ross. Team Omar has worked extremely hard and, despite an injury during the time with the Red Rock Relay Team, finished the season on a high point. Apart from the final competitive success of the weekend the entire week has proved a remarkable period for John, whose baby granddaughter Lucy was born in Edinburgh just as Team Omar was preparing to head north. Further excitement came with the news that his book Drinking the Wind : At the limits of endurance had climbed into number three position of equestrian books on Amazon. “We owe a great deal of thanks to a huge amount of people and especially to our nutritionist Jane Van Lennep of Simple Systems horse feeds,” he commented. “I would also like to take this opportunity to thank all the farmers and residents around the Lochty and Balhall area for their support and patience during the last few months of training. “A special thank you is also due to Valerie McLeod and Lindsay MacCabe at Cowford who provided us with the excellent facilities for Omar and have devoted so much of their time in “babysitting” a very special Arabian horse,” concluded John. The U.S. Endurance Team collected a historic number of medals at the 2011 Pan American Endurance Championships in Santo Domingo, Chile. Taking the Team Silver medal in a combined time of 19:05:19 was John Crandall III with Heraldic, Valerie Kanavy and Spectacular Gold and Deborah Reich and Pandor. Meg Sleeper and Syrocco Cadence were eliminated at the mandatory recheck at vet gate three. The team finished just one minute and 47 seconds behind the Gold medal team from Uruguay. The home team of Chile took the Team Bronze. The veteran pair of Crandall and Heraldic completed the 120km course in 6:03:38 to win the Individual Silver medal. Finishing in 6:05:47, Kanavy and Spectacular Gold took the Individual Bronze. Riding for Uruguay, Bernardo Algorta won the Individual Gold in 5:59:27. Reich and Pandor finished in 6:55:54 to place tenth. Riding as an individual Cheryl Van Deusen and Moro Amado finished fifteenth. The U.S. team led by Chef d’Equipe Emmett Ross, set a blazing pace in the first three loops and were the team to catch most of the day. With Sleeper’s elimination at vet gate three the riders implemented a different strategy for the fourth and fifth loops. This is the most medals the U.S. has collected at an international Endurance competition. 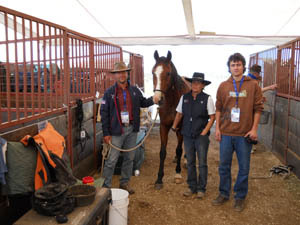 Endurance riders from Uruguay claimed Team and Individual gold in the Senior division, while the host nation of Chile dominated the Young Riders classes at the 2011 Pan-American Endurance Championships staged in Santo Domingo (CHI) last weekend. Bernardo Algorta registered an impressive average speed of 20 kilometres an hour with his horse, Cacique, to take the Senior title for Uruguay, while Chile's Sebastian Taverne and Eclipse covered the challenging course at an average of 19.73 kmh to secure the Young Rider honours. Attention to detail in the preparation of the venue and facilities in Santo Domingo drew high praise for the Organising Committee from competitors, officials, supporters and spectators alike. But the highest accolade of all was heaped on by Chile's President, Sebastian Pinera, who attended the event and said that it provided "a great boost to Chile and to South America in general". The history of Endurance in Chile dates back to a visit by a group of enthusiasts to the FEI World Championships at Fort Riley in Kansas, USA back in 1996. On returning home they introduced the discipline to their native country, and began to organise races over distances of between 40 and 80 kilometres. Chilean competitors who rose to prominence during the early years included Marcial Taverne, Antonio Llompart, Alejandro Donoso, Marcelo Cortes and Ignacio Urenda. With its wide variety of weather and topography stretching from the Pacific Ocean to the imposing Andes mountains which is home to the Condor - the massive and majestic bird that is the national symbol of Chile - this country provides an extraordinary environment for this ever-expanding sport. Every month, over 200 riders assemble at a new venue not only to compete, but also to appreciate the beauty of the natural world that surrounds them, and to share that experience with their horses. The 2011 Pan-American Endurance Championships, organised by the Chilean Association of Equestrian Endurance, took place at the 9,000 hectare resort of Brisas de Santo Domingo, located in the centre of the country and on the shores of the Pacific. The circuit crossed both flat terrain and some mountainous areas, beginning by the sea and then climbing to a plateau filled with lakes and a great variety of flora and fauna including black-necked swans, foxes and hares and exotic trees like the Quillay and Peumo. The course, covering a distance of 120kms, was divided into five loops - the first 30kms long, the second 25km, the third 30km, the fourth 20km and then a fifth and final loop of 15km, and it demanded great skill on the part of the riders in their efforts to ensure their horses finished in good shape. They showed exactly that when there was a 63% completion rate in the Senior competition and 58% in the Young Rider section in which, however, the team from Chile were the only finishers when taking gold. Sebastian Taverne (Eclipse), Benjamin Boetsch (Khadijah) and Pablo Llompart (Ankar Samuray) recorded a combined riding time of 7:09:38, and Taverne's average speed of 19.73 khm confirmed him as Individual Young Rider Champion ahead of Colombia's Cristina Mutis (Tiawa) whose average speed was 19.41 kmh. Boetsch (Khadijah) took Individual bronze with an average speed of 18.87 khm, and a total of 14 horse-and-rider partnerships from five nations - Chile, Colombia, Argentina, Ecuador and Uruguay - competed. Uruguay's Bernardo Algorta enjoyed an even bigger celebration when his horse, Cacique, was presented with the Best Condition Award - no mean feat having completed his race with a sensational riding time of just 5 hours, 59 minutes and 27 seconds and that 20 kmh average speed for the Senior Individual title. But Senior silver medallist, John Crandell (Heraldic) from the USA was close behind when clocking 6:03:38 with an average speed of 19.8 kmh, and his team-mate, the veteran Valerie Kanavy (Spectacular Gold) took the bronze when only fractionally further behind with an average speed of 19.7 kmh. It was a close-fought battle for the Senior Team title, with the American side of Crandell, Kanavy and Debora Reich (Pandor) having to settle for silver when Uruguay's Sofia Castells (Canuto Molles), Paula Fort (Campanina) and Jorge Martinez (Nagfour) finished almost two minutes faster. Chile's Lukas Buckel (Konsterrus), Alejandro Kil (Al Hatal El Shammaat) and Ana Maria Novoa (Pistrat) took bronze. Senior Teams: GOLD - Uruguay 7:03:32: Canuto Molles (Sofia Castells), Campanina (Paula Fort), Nagfour (Jorge Martinez); SILVER - USA 7:05:19 - Heraldic (John Crandell), Spectacular Gold (Valerie Kanavy), Pandor (Debora Reich) ; BRONZE - Chile 9:42:49 - Konsterrus (Lukas Buckel), Al Hatal El Shamaat (Alejandro Kiss), Pistrat (Ana Maria Novoa) . Senior Individuals: GOLD - Cacique (Bernardo Algorta) Uruguay 20 kmh; SILVER - Heraldic (John Crandell) USA 19.8 kmh; BRONZE - Spectacular Road (Valerie Kanavy) 19.7 kmh. Young Rider Teams: GOLD - Chile 7:09:38 - Eclipse (Sebastian Taverne), Khadijah (Benjamin Boetsch), Ankar Samuray (Pablo Llompart). Young Rider Individuals: GOLD - Eclipse (Sebastian Taverne) CHI 19.73 kmh; SILVER - Tiawa (Cristina Mutis) COL 19.41; BRONZE - Khadijah (Benjamin Boetsch) 18.87. Uruguay's Bernardo Algorta riding Cacique won the 2011 Pan American Championship for the Gold Medal on Friday 21 October 2011 in a riding time of 5:59.27 for the 120 km. USA's John Crandell, riding Heraldic, won Silver, finishing 4 minutes behind Algorta. Heraldic was in the lead when he fell 1 mile from the finish line - "it winded me for a bit, but when I got up I was able to shake it off" in Heraldic's own words - and went on to finish in 6:03.38. Valerie Kanavy and Spectacular Gold finished third for the Bronze medal, 2 minutes behind Crandell. Uruguay won Team Gold (Sofia Castells on Canuto Molles, Paula Fort on Campanina, Jorge Martinez on Nagfour), USA won Team Silver (John Crandell on Heraldic, Valerie Kanavy on Spectacular Gold, Deborah Reich on Pandor), and Chile on Team Bronze (Lukas Buckel on Konsterrus, Alejandro Kiss on Al Hatal El Shamaat, Ana Maria Novoa on Pistrat). In the Young Rider division, Chile's Sebastian Taverne on Eclipse won Gold in a riding time of 6:04.58 for the 120 km. Colombia's Cristina Mutis riding Tiawa finished 2nd for the Silver medal 6 minutes later, and CHile's Benjamin Boetsch riding Khadijah finished in 6:21.34 for the Bronze. Chile won Team Gold (Sebastian Taverne on Eclipse, Benjamin Boetsch on Khadijah, Pablo Llompart on Ankar Samuray) and was the only Young Rider team to finish. Al Wathba, Abu Dhabi, UAE. Heart Rates: Maximum pulse at Vet Gates - 64 bpm within 20 minutes. At final exams, maximum pulse of 64 within 30 minutes. Brittany is among the best area for endurance horses breeding with nearly 400 Arabs and part Arab mares covered each year. A lot of winners come from this place such as: Kergof, vice champion of France in 2010 of 160 km, Lubiana deCoat Frity, third Florac 2009 and second 160 km in 2010, Major Armor Pertre winner of 120 km in 2010 and 2011 champion of France on 120 km., Mario de Plouvorn, champion of France 2010 on 160 km. And 6 of the 17 horses selected on the ‘’long list’’ for the European Championships come from this area. Moreover, on the 16 first horses of the European Championship of Florac, 4 horses are born in Brittany. ACA Bretagne Endurance Association is the group of Brittany endurance horse breeders and Arabian breeders. With a hundred members, it is now the first regional association. They have the pleasure to invite you to the second annual Endurance Horse Festival to take place in Morlaix (Langolvas Exhibition Centre) 18, 19 & 20 November 2011. Program: On Friday, November 18 at 8 p.m. : Dinner on sales on reservation, Presentation of 40 horses selected according to genetics and to performance. Origins represented in 2010 : Akim, Arques Perspex, Dormane, Fadasir, Fakir de Domenjoi, Tauqui el Masan. Saturday 19 and Sunday 20 November: horse shows, competitions and interregional presentations of young endurance horses. We are at your disposal to organize and facilitate your arrival in Brittany. Glanders, the equine disease which has devastated the kingdom’s equestrian community and looked close to being eradicated from the kingdom’s shores, has reared its ugly head again. Two horses from the Dilmun Stables in Saar have tested positive to the killer bacterial infection and the results are awaited on the condition of a third pony following an inconclusive finding. The movement ban on horses across the island has been extended for another four months and the endurance horse riding competition planned as part of the GCC Games’ eleven disciplines was swiftly withdrawn from the Bahrain 11 programme of events which have been reduced to 10. Whilst there are conflicting reports over the numbers of horses and ponies destroyed after testing positive to glanders, officials state ‘more than 70’ horses have had to be put down since the outbreak in early 2010. Over the summer it appeared that the battle against glanders was being won, after three rounds of testing involving every horse and pony on the island came through as ‘negative’ ... until just a few weeks ago. Experts say that testing in the immediate area will have to continue and the chances are that Bahrain will not be officially declared ‘glanders free’ for at least another 14 months because international authorities demand a six-month period of grace after all retests have returned negative ... provided no new cases are discovered in the meantime. The disease, caused by the highly-infectious bacterium burkholderia mallei, occurs primarily in horses and can stay dormant from three weeks to eight months, or in rare cases even longer. Strict measures were introduced across Bahrain following the first outbreak and popular show jumping events were cancelled. At the time the Dilmun Stables introduced some of the most stringent measures in the kingdom in an attempt to keep the facilities free of the disease. However, the stable team’s best efforts were in vain after two horses tested positive last month and were subsequently put down. The blood samples were sent to the Central Veterinary Research Laboratory (CVRL) in Dubai – one of the only two authorised laboratories in the world certified by the Office International des Epizooties – World Organisation for Animal Health (OIE) in Paris for testing glanders. Everything is almost ready in Santo Domingo Chile .All the foreign teams have arrived and some of the local team Chile were arriving today .The organization has done a great job to look for all the details to have a great event.Usa ,uruguay and brasil have brougth very strong teams altough chile has the advantage to race at home. The track will be very technical,with 2 loops very hilly and 3 loops very flat. Temperature and humidity won t be a problem the day of the race. Congratulations to Bridi Rice and Pocket Full of Posies with a successful completion at the NSW State Championship Endurance Ride where they completed their first160km... in the rain! The diminutive pair were almost swimming as they crossed the last river in pitch black and pouring rain. They were the last pair through before the crossing was deemed unsafe and closed. The conditions were appalling, I drowned 3 coats over the 20 hours I was on duty, one of them a well-oiled drizabone. I lifted a Keiffer saddle that had no dye left in the panels and must have weighed at least 15 kilos! Riders commented it was the first ride they had ever come in having gained weight instead of lost it! LAST Thursday afternoon, people on the streets of Merredin may have noticed a group of people riding their horses along Barrack Street. The horse riders were on day six of their endurance horse ride from Mundaring to Kalgoorlie to raise funds for cancer research, education and support services for the WA Cancer Council. Holly Bongers, Larissa Cooney, Bessie Traylen and Maddison King are all young members of the Wooroloo Horse and Pony Club who jumped at the chance ride along the pipeline for a good cause. The girls aged 14 and 15 aim to raise $25,000 during their 14-day trek to Kalgoorlie called ‘Kalgoorlie or Bust’. On day six, they left Kellerberrin for Merredin and they were half way there having already raised $12,500. However, this was no easy task; the girls have had 12 months of physical endurance and mental training in preparation for the event and were starting to feel the strain and exhaustion during their stopover in Merredin. Every day the girls wake up at 4.45am to feed their horses, go back to sleep, then wake up again to have their breakfast at 6am before they hit the road at 6.30am. The girls are usually on the road for about five hours before they stop to rest for the day. About 20 people, including friends and family of the girls, have come along for the pipeline ride by driving in support vehicles. Holly Bongers said she decided to participate in the fundraising event because her grandfather suffered from cancer and all the other girls had been close to cancer at some stage in their 14 years. It was then decided to make something that they love to do and turn it into a fundraiser for the WA Cancer Council. SOME five years of endurance training between horse and human will reap the ultimate reward for Woodville's Dean Walkom. The long-distance horserider, who competes in some of the most gruelling rides in the country, has trained his horse to carry him incredible distances in the sport known as long distance endurance horseriding. Dean and his equine companion, Santa Pasa Zaraq, of Arabian breed, will receive the prestigious "Big three Award" next year. The award recognises that the horse and his rider have competed in and successfully finished the NSW state championships, Shazdada 400km marathon and the Tom Quilty National Championships within the space of a year. Both championship events consist of a 160km journey from start to finish while the marathon is a 400km trek spread over five days. Dean most recently completed the Tom Quilty ride over the October long-weekend. "The horse pulled up really well," Dean said. "He just powered on to the finish." The horse, at 12, is at the peak age for long-distance endurance riding and will now have a three month spell. The task of competing in these rides took Dean five years, in which he broke in his own horse and trained it over 40, 80 and 120 km distances. Setiu, 9 October 2011 – Coming in first place at the Sultan Mizan Cup 2011, Wipawan Pawitayalarp of Thailand rode home with USD20,000 in her pocket and an AmaSwiss watch worth USD17,200 on her wrist. Wipawan astride Mulawa Angelus completed the 120 km track in 6:17:43 with an average speed of 19.06 km per hour. Next to finished in good condition was M. Marlon and Mohammad Fuad Hashim from the State of Terengganu Endurance Team (STET) who clock a time of 6:29:17 riding at an average speed of 18.5 km per hour. He received a tidy sum of USD14,000 as the second place winner. In third place was Zelma Lotter from South Africa riding for TMKN Equestrian on board Nashaar, who won USD10,000 after having completed in a time of 7:02:35 with an average speed of 17.04 km per hour. Completing the ride in 7:38:30 on Shardell Gazalan, Warit Khuntarhporn from Thailand rode into fourth place at an average speed of 15.7 km per hour. Mohd Sulaiman Muda of Royal Terengganu Endurance Stable mounted on Jakim Murphy came in fifth, clocking 8:15:15 and an average speed of 14.54 km per hour. Warit and Sulaiman received prizemoney of USD6,000 and USD4,000 respectively. The much coveted Best Conditioned Horse Award went to M. Marlon ridden by second place winner Mohammad Fuad Hashim, who won additional prizemoney of USD6,000. The prizemoney for the 2011 Sultan Mizan Cup has been doubled that of last year. The Honourable Dato’ Seri Hj Ahmad Said, Chief Minister of Terengganu presented prizes to the fifth, fourth, third and second place winners while His Majesty, the King of Malaysia, Tuanku Mizan Zainal Abidin did the honours for the Champion of 2011 Sultan Mizan Cup as well as the winner of the Best Conditioned Horse Award. Riders who completed the Sultan Mizan Cup International Endurance Challenge successfully each received an award of USD6,000 and a buckle, a tradition of the sport of endurance. They were Nik Sabarudin Nik Daud, Mohd Nizan Muda, Muhamad Adhwa Embong, Syarifuddin Shamsul Anuar, Mohd Halim Abd Rahim and Mohd Afendi Mohd Rafi. His Majesty Tuanku Mizan Zainal Abidin riding RTES Smith, a 9-year-old gelding, was among the 53 Malaysian riders from teams across Malaysia. The other riders were from Australia, Chile, Slovakia, France, Indonesia, Singapore and Thailand. Ian Williams, FEI Director of Endurance said, “I witnessed yet another superb competition. The ride was very tough for both the riders and horses. I must say it is a world-class event. The officials and support crew did a fantastic job. It is not easy to run an endurance ride in conditions like you have in Terengganu. Williams also remarked that the facilities at Terengganu International Endurance Park are first-class and that it is one of the top three endurance villages in the world. Jointly organised by the Terengganu State Government and the Royal Terengganu Endurance Stable, the 2011 Sultan Mizan Cup was held from 7-9 October at the Terengganu International Endurance Park. Sponsors of the Sultan Mizan Cup 2011 include Sime Darby Berhad, Norlan United & Carriage Sdn Bhd, AmaSwiss, Public Bank Berhad, Syarikat Air Terengganu Sdn Bhd, Mitavite Asia Sdn Bhd and Ari Usaha Murni Sdn Bhd. Lexington, KY - The United States Equestrian Federation has named the following horse/rider combinations for the 2011 Pan American Endurance Championship being held in Santo Domingo, Chile, October 22, 2011. Running over a 120km course, riders will race for both Team and Individual medals. Two members of the Silver medal winning U.S. team from the 2009 Pan American Endurance Championship in Uruguay will once again represent the U.S., Kanavy and Van Deusen. Kanavy, who finished sixth individually in 2009 will ride her own Spectacular Gold, a 9-year-old Arabian gelding who has raced to top ten finishes both in the U.S. and abroad. Van Deusen will ride Moro Amado, owned by Argentinian endurance competitor Miguel Pavlovsky. The U.S. will also be represented by two members of the U.S. team from the 2010 Alltech FEI World Equestrian Games (WEG), Reich and Sleeper. Reich, the only U.S. rider to complete the WEG course, will ride her new partner Pandor. The 12-year-old Arabian gelding has finished in the top 10 in all CEI outings in the last three years. Sleeper will ride her homebred mare, Syrocco Cadence, an eight-year-old Arabian. The pair most recently finished second at the Asheville CEI3* 160km. Crandell and Heraldic, a 13-year-old Arabian gelding, are veteran partners having been the first pair in history to win the endurance "Triple Crown" crossing the finish line first at the Old Dominion 100, Tevis and the AERC Championship 100 in 2006. In 2010, the pair took two legs of the "Triple Crown" winning at the Old Dominion 100 and at Tevis. This will be Crandell's second time representing the U.S., having ridden on the U.S. team at the 2008 FEI World Endurance Championship in Malaysia. Rounding out the U.S. team is Blittersdorf and Synthetic. Partners since 2003, Blittersdorf and Synthetic began competing in CEI events in 2008 and have consistently finished in the top 10. SETIU, Oct 9 (Bernama) -- The state government will ensure the Sultan Mizan Cup Endurance Challenge 2012 will be a more exciting affair offering bigger prize money next year to attract more local and foreign riders. State Youth and Sports committee chairman Rozi Mamat said that more international riders would be invited to participate in the tournament next year. "Therefore, we will enhance the tournament to be more exciting and better in future. The state had set aside a bigger allocation for prizes this year," he told reporters after the Sultan Mizan Cup Endurance Challenge 2011 prize-giving ceremony here Sunday. Also present was the World Endurance Equestrian Championship (FEI) director Ian Williams. Williams said that the challenge could be expanded across Asia since Terengganu has a strategic venue that was suitable for high-level tournaments. SETIU (Terengganu), Oct 9 (Bernama) -- Wipawan Pawitayalarp of Thailand rode home first to pocket RM63,000 cash and an AmaSwiss watch worth RM54,000 at the Sultan Mizan Cup 2011. He completed the 120km track astride Mulawa Angelus in 6:17:43 with an average speed of 19.06km per hour. This is the third time Wipawan, 35, has competed in the endurance challenge formerly known as the Sultan's Cup Terengganu Endurance Challenge. Mohammad Fuad Hashim from the State of Terengganu Endurance Team (STET), riding M Marlon, finished next on 6:29:17, and received RM44,000 as the second-placed winner. M Marlon won the Best Conditioned Horse Award, and for that, Mohd Fuad received an additional prize money of RM18,000. In third place was Zelma Lotter on board Nashaar, winning RM32,000 after having completed in a time of 7:02:35. Completing the ride on 7:38:30 astride Shardell Galazan, Warit Khuntarhporn rode in fourth while Mohd Sulaiman Muda on Jakim Murphy came in fifth, clocking 8:15:15. The fourth prize winner took home RM19,000 and fifth, RM13,000. A total of 11 riders who completed the 120km race were awarded a sum of RM6,000 and a buckle, a tradition of the sport of endurance. Yang di-Pertuan Agong Tuanku Mizan Zainal Abidin, riding RTES Smith, a nine year-old gelding, was among the 53 Malaysian riders from teams across Malaysia. The other riders were from France, Australia, Slovakia, Indonesia, Singapore and Thailand. Raja Permaisuri Agong Tuanku Nur Zahirah and Terengganu Menteri Besar Datuk Seri Ahmad Said were present at the prize-giving ceremony today. Jointly organised by the Terengganu government and the Royal Terengganu Endurance Stable, the Sultan Mizan Cup 2011 was held from Friday to today at the Terengganu International Endurance Park (TIEP) in Lembah Bidong here. WHEN most school students were spending the holidays playing video games and hanging with their friends, Wagga's Courtney Lewis was competing for a national title. The 14-year-old Mater Dei Catholic College student made the marathon two-day road trip to South Australia's Barossa Ranges to compete in the prestigious Tom Quilty Gold Cup. The cup is the national championships for endurance horse riding and brings together hundreds of Australia's best riders. Created by famous Australian horseman Tom Quilty in 1966, the Gold Cup is now known as the largest professional endurance ride in the southern hemisphere. It was Lewis's first time travelling to South Australia to compete, and she ended up running third in the junior division on horse Kyang Mister Personality. The pair was one of just nine to finish the 160-kilometre endurance ride in their division, and Lewis returned home to Wagga with one of the coveted buckles she went over there to claim. She says while the trip took a lot of effort and organising, she loved the experience and was stoked with the result. The route was different, but the results were quite familiar for Jeremy Reynolds at the Tevis Cup endurance ride Saturday. The endurance horse trainer from San Jose rode to his third Tevis Cup Saturday evening. He completed the re-routed ride in 9 hours, 31 minutes, accounting for the two hours of required rest time. The ride began in Auburn for the first time after heavy snow high in the Sierra left much of the trail too dangerous for the horses to navigate. Tevis Cup was postponed from its usual July start because of the unusually deep snow pack in the Sierra that lingered through the summer. Reynolds won atop 7-year-old Riverwatch after winning Tevis in 2004 and 2007 on CV Eli. Reynolds rode with 19-year-old Rachel Shackelford at the front of the field for much of the day before pulling ahead for good about 12 miles from the finish. Shackelford finished second, wearing a broad smile as she rode into McCann Stadium and tearing up at the finish. The Placer High graduate and Lincoln resident rode BR Cody del Sol, a 17-year-old Arab who completed his final endurance ride in style. Reynolds imparted some of his riding knowledge to Shackelford as they rode Saturday. The two met when Rachel was just 9 at the Fort Shelbourne Endurance Ride and they’ve ridden together several times since then. Shackelford was happy to be able to pick up some tips on her to the impressive result. Reynolds said he was impressed by Shackelford’s maturity. She slowed down late in the race, sensing her horse’s fatigue. “She put the horse first and I admire her for that – especially because she’s such a young rider,” Reynolds said. Saturday’s victory was the latest and most prestigious in a series of impressive results for Reynolds, whose wife Heather is also a former Tevis winner. Reynolds has won rides each of the last three weeks, including the North American Endurance Team Championship in Plumas County. Dennis Summers of Gifford, Wash. rode in just before 8 p.m. Saturday night to claim third place. Dayna Weary, from Prescott, Ariz., placed fourth, followed closely by Garrett Ford of Durango, Colo., and Scottsdale, Ariz. resident Clydea Hastie. Riders have 24 hours to complete the ride and earn a coveted Tevis Cup completion buckle. The top 10 finishers are eligible for the prestigious Haggin Cup, which is awarded to the horse judged most fit to continue riding at the finish. The Tevis Cup and Haggin Cup will be awarded today at the Gold Country Fairgrounds. There will be a barbecue at 1 p.m. followed by the awards ceremony at 2 p.m.
See Monday’s Journal for results of the Haggin Cup judging. HE was told it couldn’t be done, but Cherry Cummins and her horse Winter showed all doubters when they completed a 400km endurance ride, coming fourth in their weight division. Ms Cummins, 21, and Winter took part in the Shahzada, a five-day ride around St Albans in northwest Sydney. The Oxford Falls pair rode for up to nine hours every day of the Shahzada, billed by organisers as the longest annually held endurance riding event in the world. She was told by her riding colleagues the event would be impossible for Winter, since the 12-year-old gelding has a clubfoot and was difficult to motivate. LEGENDARY endurance rider Meg Wade has staged a remarkable comeback from a near fatal injury to ride at the Tom Quilty Gold Cup. Meg, who suffered a brain injury in a horse riding accident almost three years ago, completed a "celebrity" 5km ride at the prestigious event. Still aided by a walking frame, she completed the ride aboard an Anglo Arab mare called Actress. She was accompanied by fellow competitor and friend, Ron Males, a winner of 25 Tom Quilty buckles. Meg was buoyed by her stable rider Kristy Taprell winning this year's 160km Tom Quilty riding Kurrajong Concorde in 10 hours, 10 minutes and 42 seconds. The Cup was held at Mt Pleasant in South Australia on September 30-October 1 and attracted 193 entries. Staged in adverse weather conditions, the race resulted in 60 per cent of competitors completing the course. Meg is the only person to win the Tom Quilty a record four times, and was ten times awarded Australian Endurance Rider of the Year. She suffered a fractured skull in a fall from her horse during a 100km endurance ride at Tumbarumba, in southern NSW, in April 2009. Meg was airlifted to Canberra in a coma and then spent nine months at Epworth Hospital in Melbourne. Defying medical opinion she would never ride again, Meg took her first steps aboard a horse at Riding for the Disabled in Melbourne last December. "I had my first 5km introductory ride in Victoria a few months ago and it was pretty special to be back in the saddle," she said. "The best thing was I wasn't scared at all. "I am taking things step by step." Meg is aiming to complete a 20km introductory ride. "I am walking now and need to get to the point where I can trot first – it will take time," she said. Meg runs Castlebar Arabian stud with husband Chris Gates at Burrowye, in the Upper Murray. KUALA LUMPUR, October 4 - Sultan Mizan Cup formerly known as Terengganu Sultan Cup Endurance Challenge is a world-class event that has always been more than just a sport of endurance for horse lovers. It brings together sports and entertainment in a single venue catering to people from all walks of life. This year, Sultan Mizan Cup is back again with more fun-filled activities and a series of entertaining events at the Carnival on 7 to 8 October 2011 that is meant for the whole family. Among the activities scheduled are model horse colouring competition by secondary students, Pony Club Mounted Games Challenge, colouring contests for kids, face painting, coral and marine life exhibition, carriage rides, food and game stalls, street soccer tournament and many others. The public should be on the lookout at this event for the model horse colouring competition. The horse model made from fibre glass is as big as the real-life horse. The students will have to create a piece of art reflecting the theme of the event – the exquisite and beautiful corals of Terengganu. The carnival is specially designed for the whole family, and kids will get to enjoy the fun offered by the many activities. Both children and adults will have their share of excitement as they watch Pony Clubbers from Terengganu face-off each other in teams to win the Pony Club Mounted Games Challenge which will be held over 7 and 8 October. The street soccer tournament, also held over two days, will see footballers under 18 years old competing on Friday, 7 October, and the open category will be on Saturday, 8 October. Winners from both categories will be awarded with cash prizes. Advance registration is required for all those who are interested in joining this fun and healthy tournament. Set to rock Lembah Bidong with performances by popular artistes such as Faizal Tahir, Hujan, Bunkface, Shiha Mentor5, Black Mentor3, Faizal AF4 and many more. the concert this year is from 8.00 pm to 11.00 pm on 8 October. The carnival which admission is FREE opens on 7 October from 3.00 pm to 10.00pm and 8 October 2011 from 9.00am to 10.00pm. Sultan Mizan Cup with its new brand identity is set to cement itself as the most important event in Terengganu and the premier endurance event in the nation. It is being repositioned as a world-class premier endurance event that is important for the region. The CEI 2* Sultan Mizan Cup run over a distance of 120 km with five phases over undulating terrain. The endurance race has a time limit of 12 hours including holding time totalling 210 minutes at the first four vet gates. The first phase is 30 km, second phase is 25 km, third phase is 20 km, fourth phase is 25 km and the fifth and final phase is 20 km. His Majesty, Yang DiPertuan Agong Tuanku Mizan Zainal Abidin, an endurance aficionado, will be competing at the 2011 Sultan Mizan Cup. More than 60 riders are expected to compete this year for a total prizemoney of USD68,000.00 which has been doubled since last year. The first prize is USD20,000, second is USD14.000, third is USD10,000, fourth is USD6,000 and the fifth prize is USD4,000. The winner of the Best Conditioned Horse will receive prizemoney of USD14,000. Malaysia is fielding the biggest contingent and the other riders are from Argentina, Australia, Chile, Czech Republic, Indonesia, Singapore, Thailand, United Arab Emirates and Uruguay. Kids who have horses and ponies are usually a little tougher than your average teenager! The thought of spending more time with their beloved mate, camping out under the stars and bonding with their “best- horse-friend” is irresistible. So when the idea came about for a ride to Kalgoorlie along the Golden Pipeline these four friends jumped at the chance. Holly Bongers, Larissa Cooney, Bessie Traylen & Maddy King are all members of the Wooroloo Horse and Pony Club, a small club, in the Perth Hills. All the kids have been close to cancer at some stage in their 14 years and it was decided to make something that they love to do, into a fundraiser for the WA Cancer Council. The girls asked Kylie Martin, a good friend and mentor, to come on board. Kylie is an endurance rider and also has a business in horse massage, Kyanna Equestrian – Healing Hands for Healing Horses. SCREENING OF YOUTH RIDERS RAID - ABU DHABI WORLD 2011. RELATED PROVISIONAL OF HORSES COMPETING TO GO TO WORLD CHAMPIONSHIP OF YOUNG RIDERS OF ABU DHABI 2011. Of the 6 horses the 4 shortlisted will be chosen to represent the Spanish Raid after completing the tests that will convene promptly. In a riding time of 10:10.42, Kristie Taprell and Kurrajong Concorde won the S.A> Tom Quilty Gold Cup Barossa Ranges 2011. They were also the Middleweight division winners. Second place went to Deb Grull riding Lauralyn Notorious. Tied for third place were Akhmed Pshunov riding Tarrangower Crecendo, and Matthew Sample riding Brookleigh Ricardo. Heavyweight winner was Tony Purton on Beer Street Dimity; Lightweight winner was Erin Lee Krahnen on Kalkadoon Zorro; Junior division winner was James Green on Hirstglen Maybe. Complete results will be available here.